A. SwimRun participants acknowledge and understand that an adventure/endurance event comprised of multiple and alternating transits of varied terrain and open water swims may present unique and unexpected hazards outside the control of race organizers, local governments and private property owners whose property the course may utilize. All participants are required to execute a Participant Waiver and Assumption of Risk prior to competing in the SwimRun Georgia. A. 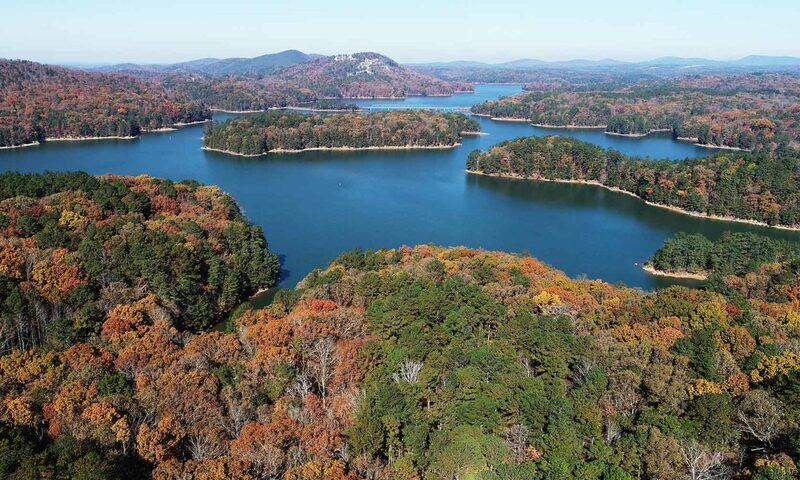 The race course will consist of alternating overland routes and swim legs on and between several islands within the Red Top Mountain State Park. Overland routes will be casually marked at various points along the course, but there will not be “turn by turn” signage. Swim exit points will be designated by flags, banners, and/or volunteers but may not be immediately visible from the swim entry point. Maps of the course will be provide to athletes online. Basic compass skills are strongly recommended. B. Any deviation from the marked course by participants shall be grounds for disqualification. Wetsuits worn by all competitors covering at a minimum, the torso and upper half of thighs. Tether between teammates for swim legs. Recommended length is 10′, but it may not exceed 30′ when fully extended. Toggle carabiner or other quick release device must be at each end. E. All equipment listed at the pre-race check must accompany the teams at all times and be present for gear check at the finish. Failure to meet this condition will be grounds for disqualification. A. Aid stations will be sited at various island locations across the course for fluid replacement and nutrition. Special needs should be carried by the athletes as needed. B. Medical personnel will be sited at various island locations and watercraft. Toilet facilities are not available due to the nature of the course, the utmost discretion is expected of athletes. Carry IN/Carry OUT. C. Team members must remain together at all times throughout the event and cannot be more than 10 yards apart. Use of the tether during the swim is STRONGLY suggested, if team mates are gapped by more than 10 yards at anytime, they are subject to disqualification. Race organizers reserve the right to make tether use mandatory as the weather may suggest for safety purposes. D. The race organization can refuse a team from continuing if they are judged to be incapable of competing safely due to fatigue or injury. E. The race organization reserves the right to cancel the event, alter, shorten, hold-in-place or otherwise change the course at any time as a consequence of weather or other unexpected course conditions beyond their control that may jeopardize the safety of athletes. F. Safety is of the utmost importance to the organizers. As with all of our events, we will be tracking the weather in the weeks and days leading up to the race. Please keep in mind that this event has a no refund policy and this includes if the race is cancelled due to an “act of God”. All race related items have already been paid for by the race production team. On race day, there is always the potential for extreme or severe weather conditions (lightening, tornado, high winds, extreme hot or cold temperatures, etc…). In the event of inclement weather due to storms, thunder, lightening, etc, the race may be delayed as race officials consult with public safety officers. If there is more than a reasonable time delay, or if conditions persist, race officials reserve the right to shorten or cancel the race. Entry fees are non-refundable. A. Checkpoints will be established on the Long Course that must be reached by a certain time in order to continue racing. Organizers reserve the right to modify these times during the race as conditions require. A. All athletes shall become familiar with, accept, and abide by, the race rules. B. At all times, athletes shall be respectful of public and private property owners. Waste shall be disposed at designated aid stations ONLY. Toilet waste paper MUST be disposed of at designated aid stations, please carry appropriate supplies to conform to this provision. Failure to do so shall be cause for disqualification. C. Athletes are participating with the full knowledge and acceptance of the risk of injury. D. Athlete teams are REQUIRED to stop and offer aid, to the best of their ability, to fellow competitors in need, or as requested by race staff. Failure to do so will be grounds for disqualification without exception or recourse. This is the spirit of SwimRun that all competitors must abide by. E. Athletes are required to attend a mandatory pre-race briefing in the afternoon prior to race day. This session will be held at Red Top Mountain State Park by the start area. Athletes failing to attend will not be permitted to race. A. Participants agree to permit the race organization to utilize photographs, video or film images taken during the event for use in marketing, press accounts, or publicity in print or digital form over all mediums of transmission.